I am a mid twenties student, currently pursuing a Masters degree in computer science at the University of Applied Science Karlsruhe. Besides my studies I am currently working for Novell taking care of some management stuff for the SUSE Linux Enterprise product line. In 2008 I took part at the Google Summer of Code and created an application for configuring server and clients in an Linux Terminal Server (LTSP) environment, it is called Easy-LTSP. 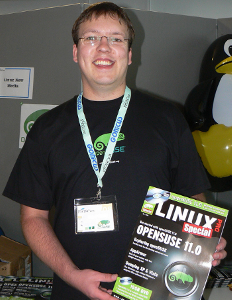 I had the great opportunity to go to Hackweek III, where I worked on the openSUSE-Education YaST module. Which has become an idea for Google Summer of Code 2009. Besides this I worked on branding packages for the openSUSE-Education project. Besides attending events and giving presentations on openSUSE I am currently active doing these things. I am part of the membership officials team handling the membership requests! I am part of the openSUSE Strategy Team trying to make a strategy of openSUSE become reality and help us getting a focus for the future. Besides these topics I am also working on openSUSE Education and GNOME, both not very active but as much as time permits and mostly marketing. This page was last modified on 25 September 2010, at 12:05.